Touchpoints serve as the point of contact between a buyer and a seller. As the race to socialize commerce escalates, these touchpoints represent the nodes that define the human network, connecting people across the social Web and uniting them around common interests, themes, and movements. While the technology to connect buyers and sellers on the social Web is universal, the architecture for true engagement is antiquated. Customers are flocking to the social web to not only connect with friends, family, and peers, but also the brands that attract their attention. However, there is a tremendous disconnect between the volume of potential customers and the brands who truly understand how to find and more importantly, how to establish mutually beneficial connections with them. The roadblocks that contribute to the absence of traffic on the bridges built between consumers and brands are trivial once brands understand the dynamics of social engineering and the allure of content in order to stimulate transactions. Everything starts with an acute awareness of where existing and potential customers are discovering and sharing information today combined with a genuine appreciation for what moves them. The moment we have the insight necessary where to construct our presences, we can then engage with influencers, peers, and consumers based on a transparent foundation of contributing value, direction and resolution to each interaction. According to research conducted by ForeSee, the opportunity for online retailers is profound. In the 2010 Social Media Report, ForeSee observed that 60% of online shoppers already use social media sites and networks regularly. And, 56% of those online shoppers friend or follow retailers, but they can only do so, if the retailer is actively engaging within those networks. The study found that only one-fourth of the top 100 e-tailers (e-retailers) has yet to create a Facebook page. ForeSee found that of all the social networks frequented by online shoppers, Facebook consistently earned the top spot. 56% of online shoppers frequented Facebook, followed by YouTube at 22%. MySpace, believe it or not, ranked third with 15% and actually edged out Twitter by 4%. However, pay attention to the real opportunity. While existing users are important, over 30% reported that they do not use social sites…at least not yet. If only 25% of the top 100 online retailers maintains a Facebook page and with Facebook ranking as the most active network among online shoppers, the following data should be more than enough to change 2010 marketing plans posthaste. Over 60% of consumers follow one-to-five brands online with another 21% following six-to-ten. 10% actually reported following 11-20 brands and 8% stated that they follow over 20 of their favorite products and services. Affinity and allegiance are of course among reasons for following brands, but as documented late last year, consumers are also motivated by receiving invitations for events, special offers or promotions. For those skeptics who have yet to allocate funds and resources to engaging customers and prospects in social networks, perhaps this information will erode suspicion. 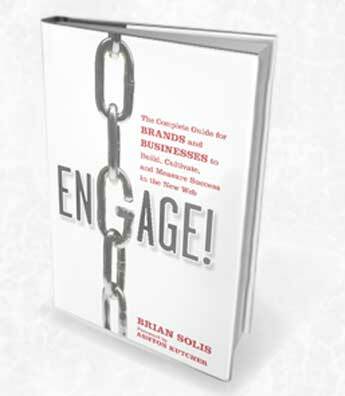 Your customers ultimately will engage with their favorite brands where and when possible, but eventually, your absence will eventually contribute to the insignificance of the brand as competitors will ultimately step in and capture the attention and loyalty of the very people you need to reach. This research is testament to the rapid evolution of customer acquisition, retention, as well as defining the new landscape for advocacy. This entry was posted on Monday, May 31st, 2010 at 8:22 am	and is filed under Uncategorized. You can follow any responses to this entry through the RSS 2.0 feed. You can leave a response, or trackback from your own site.